In tandem with its keynote at the 2014 Consumer Electronics Show in Las Vegas, Yahoo announced 'News Digest,' a new iOS app that aggregates, condenses and delivers the day's top news to users twice a day. 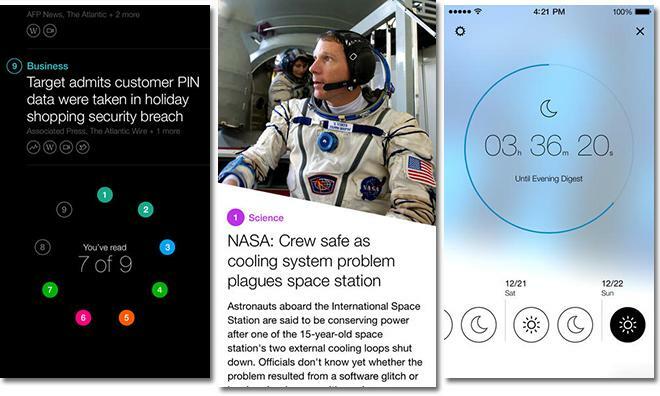 News Digest, currently limited to iPhone and iPod touch, puts a twist on the two-times-a-day news delivery format that has in some ways been usurped by the Internet's instant and always-on coverage. "We wanted Yahoo News Digest to revisit a content format that when read, led you to a sense of completion and conclusiveness, much like reading the newspaper did," Yahoo's product manager for mobile and emerging products Nick D'Aloisio wrote in a Tumblr post. D'Aloisio is the creator of Summly, a summarization and artificial intelligence technology used in a corresponding app, which was purchased by Yahoo last year. Taking lessons learned from Summly, News Digest will offer up algorithmic summaries as well as editorial selection of relevant news articles. At the heart of the app are so-called "atoms," which can be anything from article summaries, infographics, maps, videos, photos and more. Each story may contain any of these visual elements that supposedly help readers more efficiently consume content. Aside from the background technology, News Digest offers two news roundups delivered in the morning and the evening. Each digest includes nine stories with associated atoms, while a countdown timer denotes how long it will take for the next digest to arrive. News Digest is available for free as an 11MB download from the iOS App Store.